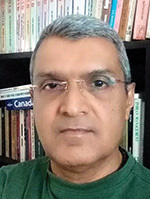 Dr Sunil Unny Guptan is a professor, mentor, life and executive coach, author, entrepreneur, motivational speaker, corporate educator, journalist and social thinker. He is based out of Hyderabad, India. He now heads Touching Lives, an initiative to make a significant difference in the lives of people. He is also Director of Emotions Toolbox Pvt Ltd, focusing on leveraging technology platforms to promote healthy social and personal relationships, emotional health and psychological wellness. He is a mentor and executive coach to several CEOs and top executives, and a popular speaker and consultant in India and other geographies. He has been teaching at IIMA for the past one and a half decade, and is also Adjunct Professor of OB & HRM at IIM Udaipur. He is a Visiting Faculty at Indian School of Business (ISB), Hyderabad and Faculty Resource of the Duke Corporate Education’s Global Learning Resource Network. His book Mentoring was released as a part of the classics series in 2013 (first edition 2006) and Executive Coaching in November 2011, both published by SAGE. He has also co-authored Indian Management, released in 1991. He has written over 80 journalistic and popular articles in various magazines and newspapers on subjects ranging from television and social processes to medical sciences and wildlife. He has also written and produced several radio and educational television programmes. He has a PhD in business management, a master’s degree in communication and journalism, and graduated with an honours degree in chemistry from Osmania University, Hyderabad, India. He has also trained at the School of Public Policy in the University of Birmingham, UK, on a British Council Fellowship. He focuses now in giving people’s life and career a positive makeover. He invests his personal time in counselling and helping people cope with and repair strained relationships and troubled lives. You can connect with him at mentor@touchinglives.co.in.